Home #JapaneseGP 2017 Valentino Rossi The precedents of Valentino Rossi - In Motegi's only significant 2008 success with irradiated title and T-shirt "Excuse the delay"
The precedents of Valentino Rossi - In Motegi's only significant 2008 success with irradiated title and T-shirt "Excuse the delay"
We reached the 15th World Championship 2017 and after 11 races, the Circus leaves Europe to move to Asia where the next three stages will be debated. The first will take place this weekend in Japan on the Motegi circuit, built and owned by Honda, which takes the official tests here. A track that, like every year, can put the exclamation point on the season and give the pilots a big baton for their vintage. 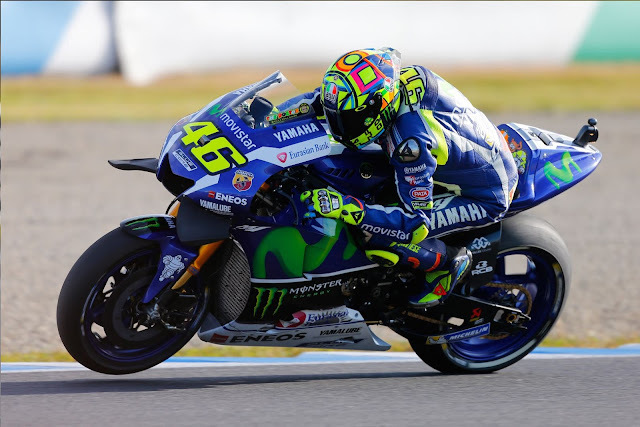 Beyond what may be between Marc Marquez (leader of the Honda championship), Andrea Dovizioso (Ducati) and Maverick Vinales (Yamaha), public interest concerns Valentino Rossi's fate in this round. The Tavullia driver reduced from the bad accident of 31 August with a tibia and leg of the right leg became the protagonist of a real return to the last weekend of Aragon (Spain), with a fifth place in the flavour of victory. The titles of the newspapers, as is logical, have been more for him than for the winner Marquez though the Cabroncito, centring the big target in Spain, has perhaps taken a decisive step towards the world triumph. Talking about wins, Japan does not evoke Valentine's memories: the fall of last year after 6 laps when he left pole position is still carved in the memory of the "Doctor. " Motegi, who in fact has only one big success at Valentino or 2008, without considering the 2001-2002-2003 triplet when he was running at Suzuka and had to weep at the last show on the current F1 race track, the death of Daijirō Katō, great hopes of Japanese motorcycling (250cc World Championship winner at Honda): Kato, while preparing to face the last chicane before his arrival on the second lap, was embarrassed by the bike, slamming against the outside protectors and because of the impact he entered coma and then lost his life two weeks later for the injuries reported. For security reasons, the organizers decided to compete for Motegi in 2004. With a thrill of emotion remembering that tragic Sunday, we return to the Tavullia pilot and happy moments like those of 9 years ago in which, in the only seal to Motegi, Rossi was able to take off the satisfaction of getting his 8th titled title in career, perhaps the most significant one for him ahead of Casey Stoner's Ducati (2007 champion) and Daniel Pedrosa's Honda.An important triumph, as we said, was that some people, especially their detractors, had begun to queues for his career: the rise of Stoner, the 2006 KO in the last race and the iris of the late Nicky Hayden to give strength to the thesis of the anti-Rossoneri. But the champion is seen in moments of difficulty and in that season Valentino was extraordinary bringing home the beauty of 9 races, playing the eighth symphony on the Japanese asphalt. A victory accompanied by the final curtain: Rossi stops at the track, changes his helmet and sits in an improvised studio of a notary signing him to sign the new helmet-document with a micro-camera on the pen to send in the world-famous historic signature. And then away with the commemorative t-shirt: "Excuse the delay", a watch stopped at 8 o'clock and a chef with world soup. A closure to the "Valentino". But to remember, there is not only this but also a third-place dense agonism. It was indelible in the minds of the enthusiasts the beautiful duel that number 46 and his teammate, Jorge Lorenzo, had in 2010, with the two who made counters to the last curve while earning the podium while Casey Stoner went to win the race ahead of Andrea Dovizioso (Honda). 2010 that could be linked to this year without wanting to make too much use of imagination. The pilot of Tavullia, in fact, was reduced from the accident of the Mugello that always cost him the fracture of tibia and perone. What can be another version of "Braveheart" of the Italian two-wheelers?